In the past 100 years, running shoes experienced dramatic changes. The question then arises whether or not running shoes (or sport shoes in general) influence the frequency of running injuries at all. This paper addresses five aspects related to running injuries and shoe selection, including (1) the changes in running injuries over the past 40 years, (2) the relationship between sport shoes, sport inserts and running injuries, (3) previously researched mechanisms of injury related to footwear and two new paradigms for injury prevention including (4) the ‘preferred movement path’ and (5) the ‘comfort filter’. Specifically, the data regarding the relationship between impact characteristics and ankle pronation to the risk of developing a running-related injury is reviewed. Based on the lack of conclusive evidence for these two variables, which were once thought to be the prime predictors of running injuries, two new paradigms are suggested to elucidate the association between footwear and injury. These two paradigms, ‘the preferred movement path’ and ‘the comfort filter’, suggest that a runner intuitively selects a comfortable product using their own comfort filter that allows them to remain in the preferred movement path. This may automatically reduce the injury risk and may explain why there does not seem to be a secular trend in running injury rates. In the past 100 years, running shoe designs have experienced dramatic changes. The running shoes in 1912 were shoes that would be considered dress shoes today (figure 1). The current running shoes are technical and engineering masterpieces and have descriptions such as support, cushioning, light weight, minimalist and barefoot. There is no question that a 2015 runner would not use the 1912 ‘running shoes’ for running activities. The question is, however, whether or not the shoes in 2015 are associated with fewer running-related injuries than the running shoes used in 1970 or in 1912. The more general question is whether or not running shoes (or sport shoes in general) influence the running injury rates at all. 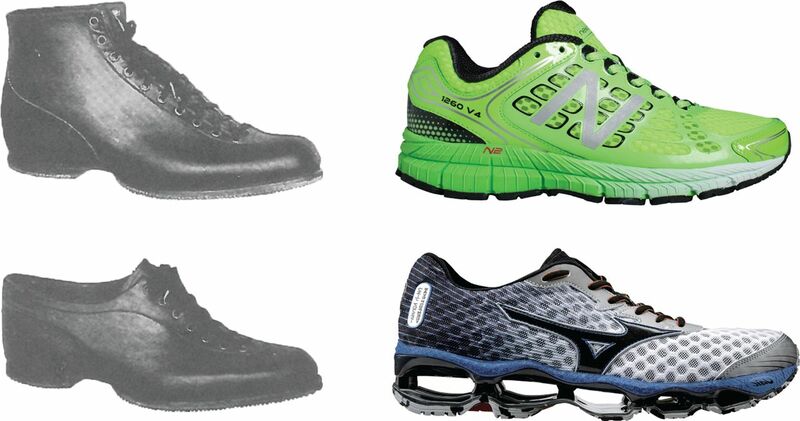 Examples of running shoes in 1912, the Spalding running shoes (left) (adapted from69 with permission from the author) and modern running shoes in 2014 (right) (with permission from New Balance Athletic Shoe, Inc and Mizuno Corporation). The changes of running injuries in the past 40 years. The relationship between sport shoes, sport inserts and primary running injury prevention. The factors that influence the frequency of running injuries, including the importance of ‘cushioning’ and ‘pronation control’. Running started to become very popular in the 1970s.1 Parallel to this development, runners started to get injured and scientific studies were published discussing the prevalence of running injuries. These studies showed a wide variety of results with relative running injury frequencies varying between about 15% and 85% of runners (figure 2).2–18 However, there seems to be no apparent secular trend (over time) for the frequency of injuries. Several reasons could explain this phenomenon. One is a change in the running population and the second is the definition of a running injury. The relationship between injury incidence and sport shoes has been at the centre of attention for several studies (table 1). The direct effect of running shoes on running injuries was not addressed until 2012.22 The earlier studies compared baseball, basketball, soccer and military shoes. The only two studies that addressed cushioning as an injury prevention strategy23 ,24 did not show a significant decrease of the injury frequency when changing the midsole hardness. Only one study compared two different running shoes with respect to running injuries.25 The difference in injury frequency between the two running shoes was about 200%. 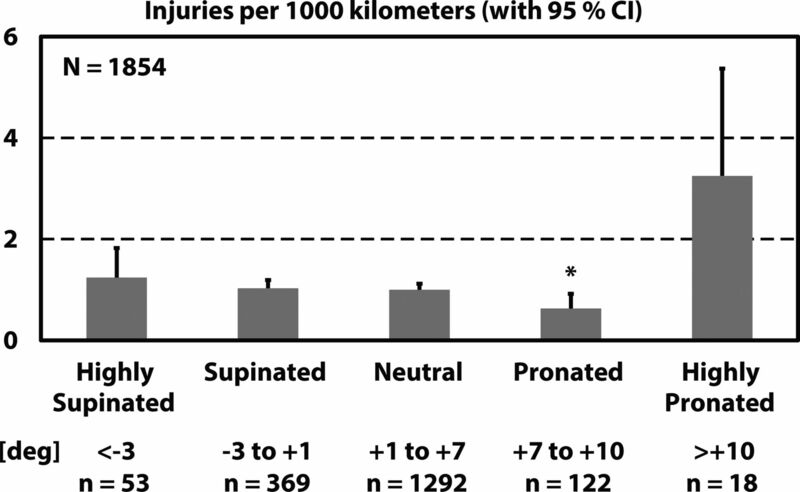 Thus, based on this study,25 one can conclude that running shoes can affect injury frequencies substantially. Several studies addressed the association between injuries and shoe inserts or orthotics.26–30 Details from selected studies that showed significant differences between two insole conditions are summarised in table 2. These studies suggest two major comments concerning the effect of orthotics/insoles on injuries, one related to the hardness and one related to comfort. Contrary to the shoe sole results, where the studies analysing the effect of soft shoe soles did not show any significant differences, the insole studies came to a different conclusion: a softer shoe insole seems to reduce injuries in military shoes and (we speculate) probably also in running shoes. From the six different insoles, five were selected as the most preferred (most comfortable) insole with about the same frequency. The test group had 53% fewer lower-extremity injuries than the control group. The only selection criterion for the insoles was the individual comfort. Thus it seems that comfort of insoles is an important factor for injuries. We propose that comfort is important for all movement-related injuries to the lower extremities. Past studies have assessed extrinsic and intrinsic risk factors for running injuries. Extrinsic risk factors, or risk factors external to the runner, include weekly mileage and training, subject injury history and the training environment.2 ,5 ,31 ,32 A variety of intrinsic risk factors that are inherent to the runner have also been identified for running injury. The two most commonly studied variables that were thought to be associated with the development of running injuries were foot pronation and impact forces during heel–toe landing. Foot pronation: Shoe inserts and orthotics had been used for many decades before the running boom in the 1970s. Foot pronation was one of the major variables discussed in the early professional literature of podiatrists.33 Consequently, when biomechanical research on running and running-related injuries started, pronation (or foot eversion) was considered an important variable for running shoe construction. Based on the existing (prerunning boom) literature it was assumed, without any epidemiological evidence, that foot pronation was one of the variables responsible for the development of running injuries. Impact forces: Impact forces during sport activities were first discussed in the mid and late 1970s.34–39 Without any epidemiological evidence, it was assumed that impact forces during running promote the running injury. Thus, it seems logical, that the running injury-related literature should be analysed with respect to the injury epidemiology of these variables. A review of the publications that attempted to assess the association between vertical impact force peaks (figure 3, top) and vertical impact loading rate and running injuries (figure 3, bottom) shows that there is no conclusive evidence that vertical impact forces are associated with running injury. The major reason for the fact that the results are not conclusive is the small sample sizes used in the cited studies. Among 15 studies, seven had a sample size below 25,40–45 seven had a sample size between 25 and 100,46–52 and one had a sample size between 100 and 150.53 While it is difficult to draw a conclusion regarding the influence of vertical loading rate on running injury frequency, it is interesting to note that as the study participant sample size increased, the relative frequency of running injuries decreased. Illustration for the difference in vertical impact force peaks and injury frequencies (top) and vertical loading rates and running injury frequencies (bottom) based on studies addressing this question. The numbers beside the points indicate the number of subjects in these studies. The vertical loading rate results for Nigg 1997 were based on data of the unpublished Doctoral Thesis of A Bahlsen 1988 ‘The aetiology of running injuries: a longitudinal prospective study’. In addition to the lack of epidemiological support for impact as an important determinant of running injury there is also a functional concern. If higher impact peaks or loading rates were associated with running injuries one would expect runners who run faster have more impact-related injuries. However, there is no study or even anecdotal evidence that this is the case. Consequently, there is no supporting evidence that vertical impact peaks and/or vertical loading rates are variables that contribute to running injuries. One finds a similar phenomenon when critically examining the variable foot pronation or foot eversion. Most studies have a rather small sample size and, consequently, the results for these studies are not conclusive. However, one study that has a large sample size.54 In this study, the foot position (foot inversion to eversion) was quantified for novice runners at the start of the data collection and running injuries were tracked for 1 year. The results are interesting result in that the injury frequency was lowest for the foot position between 7 and 10° pronated (everted; figure 4). This group had significantly less injuries than all other groups. This result shows that a pronated (everted) foot position is, if anything, an advantage with respect to running injuries. Consequently, it is difficult to find supporting evidence that foot pronation (eversion) is a strong predictor of running injuries. Static foot position and running injuries per 1000 km based on a prospective study with 1854 subjects grouped arbitrarily into highly supinated, supinated, neutral, pronated and highly pronated runners (adapted from54 with permission from the author). Consequently, there is no evidence that foot pronation (eversion) is a variable responsible for running injuries. This indicates that two variables that were thought to be the prime predictors of running injuries are not valid. What effect does changes in shoe or insert construction have on the skeletal movement during running? What is the difference in skeletal movement between shod and barefoot running? The results of the bone pin study were rather surprising. With changes in shoes and/or insoles, the changes in the actual path of movement of the calcaneus and the tibia were small and not systematic. Changes occurred primarily in the range of movement but not in the path of movement. These bone pin results and the general results of many skin mounted marker studies59–61 that showed similar effects when changing the shoe conditions were the basis for a new paradigm, the paradigm of the ‘preferred movement path’. We proposed:59 ,62 The skeleton of an individual athlete attempts for a given task (eg, heel–toe running) to stay in the same movement path, the ‘preferred movement path’. Muscle activity is used to ensure that the skeleton stays in this path. It may be, however, that the amplitude of this path varies. For instance, when running barefoot, the initial dorsiflexion of the ankle joint is reduced. However, the actual movement path stays the same. (Note: The term ‘preferred movement path’ is a working term and may/should be improved). If this paradigm is correct, the definition of a ‘good’ running shoe may have to change. A ‘good’ running shoe would be a shoe that allows the skeleton to move in the ‘preferred movement path’. A ‘good’ running shoe would, therefore, demand less muscle activity than a ‘bad’ running shoe to ensure that the skeleton moves in the correct path. The assessment of whether or not a shoe supports the preferred movement path may be difficult. Since the paradigm states that the movement does not change, assessment of movement does not help in the assessment of this question. Any assessment of a shoe with respect to the preferred movement path paradigm using movement assessment is, therefore, per definition inappropriate. It is proposed that other indirect ways should be chosen to make such an assessment (eg, muscle activity, energy demand or others). It is proposed that the ‘preferred movement path’ may be one paradigm that could replace the inappropriate paradigms of cushioning and pronation for the primary prevention of running injuries. Different subjects select different shoe conditions as the most comfortable. There are different functional groups of athletes that need different construction features to feel comfortable in a shoe (eg, some subjects like a medial support, some like no medial support). Shoe conditions that are more comfortable are associated with a lower movement-related injury frequency than shoe conditions that are less comfortable. Shoe conditions that are comfortable are associated with less oxygen consumption than shoe conditions that are less comfortable. Comfort is difficult to define and to quantify. However, it seems that shoe comfort is important for running injuries as well as running performance. We propose a new paradigm, the comfort filter paradigm as follows: When selecting a running shoe, an athlete selects a comfortable product using his/her own comfort filter. This automatically reduces the injury risk and may be a possible explanation for the fact that there does not seem to have been a trend in running injury frequencies over time. Stated differently, it is not that footwear could not have an influence on running injuries. On the contrary, footwear does appear to influence the frequency of injuries since we already choose the most comfortable shoe and avoid uncomfortable and potentially harmful footwear. We propose that the previous paradigms of ‘cushioning’ and ‘pronation’ should be replaced with the two new paradigms of ‘preferred movement path’ and ‘comfort filter’. Both proposed paradigms need substantial new research with respect to definition, verification and quantification. However, it is suggested that they may improve insight into the mechanisms of running performance and running injuries. 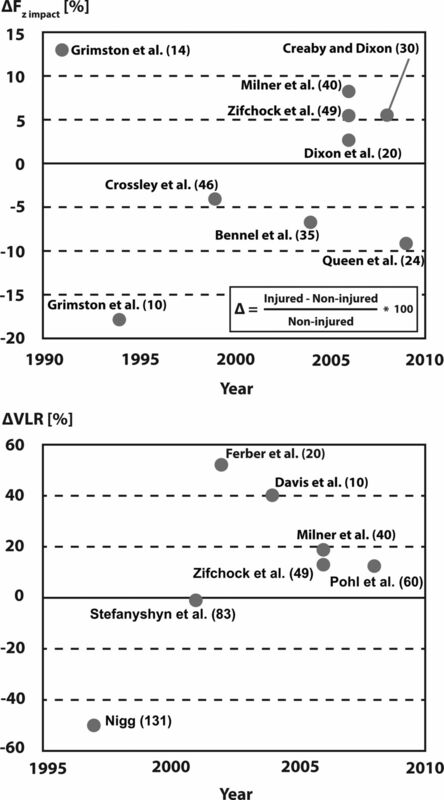 The frequency of running injuries has not changed over the past 40 years. Little evidence for pronation and impact forces as risk factors despite being considered primary predictors of running injuries. Two new suggested paradigms for predicting running injury are the ‘preferred movement path’ and the ‘comfort filter’.
. Effects of frequency and duration of training on attrition and incidence of injury. Med Sci Sports 1977;9:31–6.
. Relationships among self-reported shoe type, footstrike pattern, and injury incidence. US Army Med Dep J 2012;Oct-Dec:25–30. Prevention of stress fractures using custom biomechanical shoe orthoses. Clin Orthop Relat Res 1999;360:182–90.
. Injuries in Australian army recruits. Part I: decreased incidence and severity of injury seen with reduced running distance. Mil Med 1997;162:472–6. Rabl CRH. Orthopaedie des fusses. 2nd edn. Enke Verlag, 1946.
. Erschütterungsmessungen beim Gehen und Laufen auf verschiedenen Unterlagen mit verschiedenem Schuhwerk (Acceleration measurements during walking and running on various surfaces with different shoes). Jugend und Sport 1974;8:289–92.
. Ursachen, Klinik, Therapie und Prophylaxe der Schäden auf Leichtathletik- Kunststoffbahnen (Origin, clinics, therapy and prevention of injuries on artificial track and field sport surfaces). Leistungssport 1976;1:48–52.
. Bewegungsanalyse beim Laufschuh (Movement analysis of running shoes). Sportwissenschaft 1980;3:309–20.
. Insertionstendinose am Schienbein, Achillodynie und Überlastungsfolgen am Fuss—Aetiologie, Biomechanik, therapeutische Möglichkeiten (Tibial insertion tendinoses, achillodynia and damage due to overuse of the foot—etiology, biomechanics, therapy). Orthopaede 1980;9:207–14.
. Biomechanik und Sport (Biomechanics and Sport). Ortopaede 1974;3:140–7.
. Bone mass, external loads, and stress fractures in female runners. J Appl Biomech 1991;7:293–302.
. Does increased loading during running lead to tibial stress fractures? A prospective study. Med Sci Sport Exerc 2004;36:58.
. Dynamic variables and injuries in running. Proc Fifth Symp Footwear Biomech 2001;74–5.
. Biomechanics. Calgary: Topline Printing, 2010.
. The effect of soft foot orthotics on three-dimensional lower-limb kinematics during walking and running. Phys Ther 1994;74:836–44.
. Prevention of overuse injuries of the foot by improved shoe shock attenuation. A randomized prospective study. 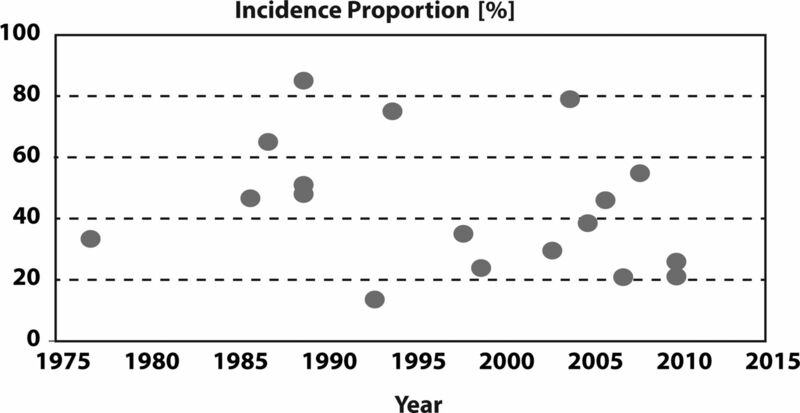 Clin Orthop Relat Res 1992;281:189–92.
. Basketball Epidemiologogy Study 1996 to 1998. Research Report for Adidas. Calgary: Human Performance Laboratory: University of Calgary, 1998.
. The biomechanics of running and running shoe problems. In: Segesser B, Pfoerringer W, eds. The shoe in sport. 1st edn. Chicago: Year Book Medical Publishers Inc., 1989:3–15.